Holiday shopping is more fun when you have a great shopping buddy. This holiday season, have fun making purchases with your Citi card a great shopping companion that not only gives you a host of conveniences and rewards, but also the opportunity to drive home a BMW sedan! 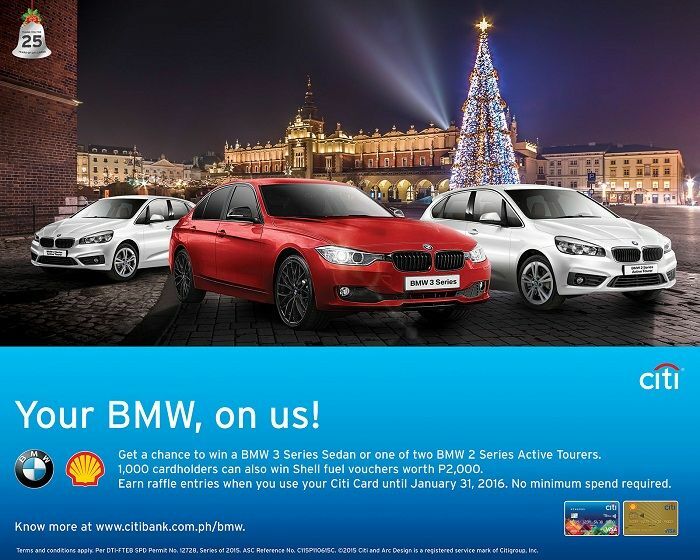 From October 26, 2015 to January 31, 2016, exciting treats await loyal patrons as Pilipinas Shell, Citi, and BMW come together for the “Your BMW, on us!” raffle promotion. One thousand Shell fuel vouchers and three BMW luxury vehicles are up for grabs for lucky cardholders. Simply use your Citi Card and earn one raffle entry for every transaction, with no minimum spend required. Two units of the BMW 2 Series Active Tourer Pure Edition and one BMW 3 Series Anniversary Edition Sedan will be given away across three raffle draws. What’s more, atotal of 1,000 lucky cardholders will also win Shell fuel vouchers worth P2,000 each in the course of the promotion. A cardholder can only win once, and all non-winning entries will be carried over to succeeding raffle draws. Earn additional raffle entries by using your Citi Card to pay for any purchase at Shell gas stations and get two raffle entries instead. You can also double your total raffle entries by registering to the promotion online via www.citibank.com.ph/bmw. As you make your rounds of holiday shopping, make sure every purchase counts by simply using your Citi card. You might even drive off in a limited edition BMW, so start swiping now. For more details and ways on how to qualify for the promotion, visit www.citibank.com.ph/bmw.